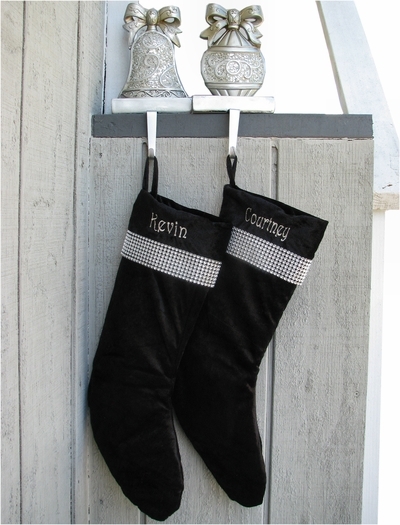 This Dazzling stocking is constructed of fine velvet with a rhinestone like wrap around cuff. Black stockings are all the rage right now as they are extremely elegant looking especially with the cuff being adorning with this beautiful silver band. Measured Stocking measures 19" diagonally from stocking loop hanger to the toe. The top opening is about 6 inches wide. Materials: Stocking is made from black velevet with a wrap around material on the cuff that represents rhinestones. Lining: YES. The interior is completely lined in black satin.